Basic. 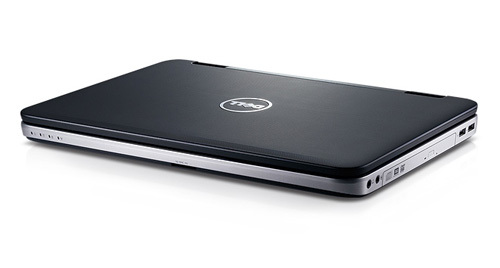 Dell now has a 15.6 inch laptop made for corporate use called Vostro 1540 available. 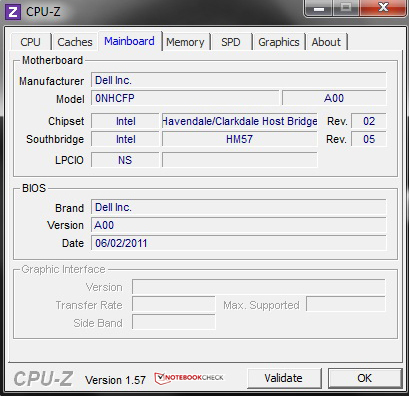 The device is not up-to-date with an Intel Core i3-370M processor. It's supposed to be a simple typewriter for smart savers. The price starts at 369 euros plus VAT and shipping. Dell expands its own B2B range with the entry level notebook, Vostro 1540, which has a 15.6 inch screen, the common 1366x768 pixels of resolution and a matt surface. 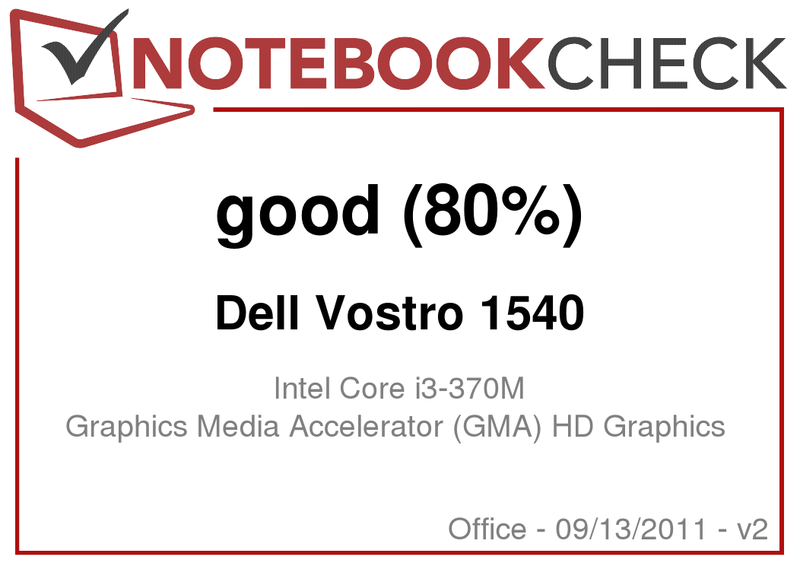 In addition to the Vostro 3550 and Vostro 3555 laptop, the Dell Vostro 1540 is the third notebook of this size category and should especially attract price conscious buyers. The starting price is about 369 euros plus value added tax (439 euros including VAT) and thus costs about 20 euros less than the new Vostro 3550. Our test device represents the premium configuration and costs 579 euros w/o VAT, respectively 689 euros including VAT plus shipping. 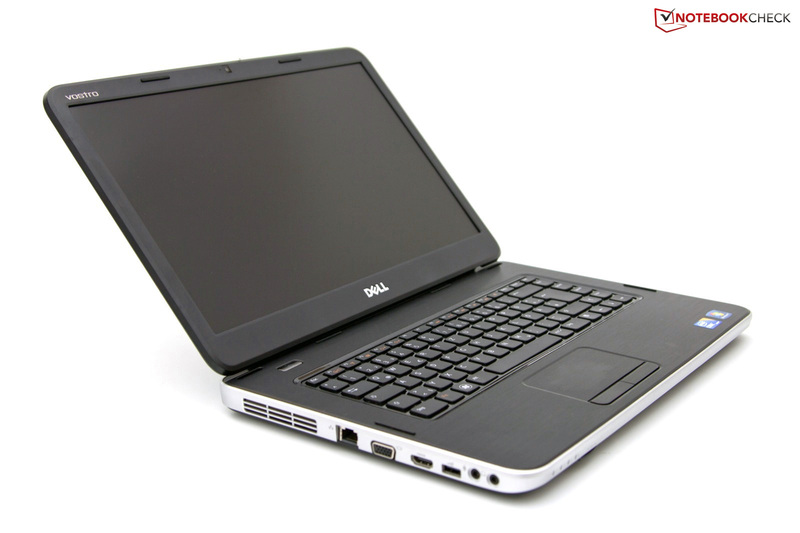 You get an Intel Core i3-370M dual core processor, a 4 GB DDR3 RAM and memory capacity of 500 GB for your money. Of course, WLAN standard 802.11n and Bluetooth 3.0 +HS are also built in. But you won't find UMTS, USB 3.0 or a docking port. 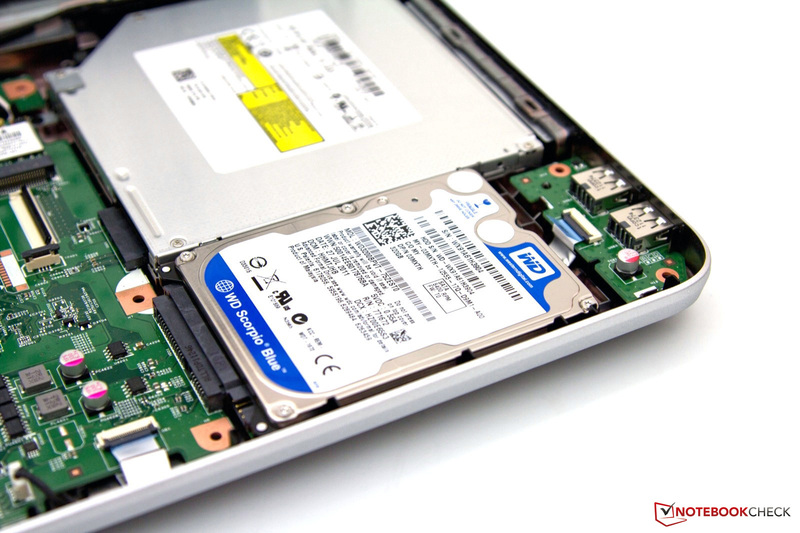 Read in this review, how this basic office notebook fares - or if you should invest a few more euros to get a device with more up-to-date components. The Vostro 1540 stands out from the other devices with a silver stripe. This laptop is not the right choice for aficionados of designer objects or products. The textured and rubberized display lid adds a small highlight. Overall, the design looks a bit too conservative and dull. But the manufacturer avoids taking a bigger "risk" this way. The plastic case's feel isn't satisfying. The silver edging and display bezel make a cheap impression. In return, the workmanship is solid and doesn't reveal any obvious weaknesses that we would have to mention negatively. The stability continues the already mediocre image. The wrist rest and keyboard yield visibly and noticeably under slight pressure in the left area. Interestingly, the DVD drive appears to support the case here. On the other hand, strong pressure causes the gap size between the silver stripe and the wrist rest to change. The display lid is also rather instable and can be easily twisted or depressed from the outside. The tightly pulled hinges have to be mentioned favorably as they keep the display in the desired position. Minus points in this aspect remain to be a slight teetering and the fact that the device can only be opened with both hands. 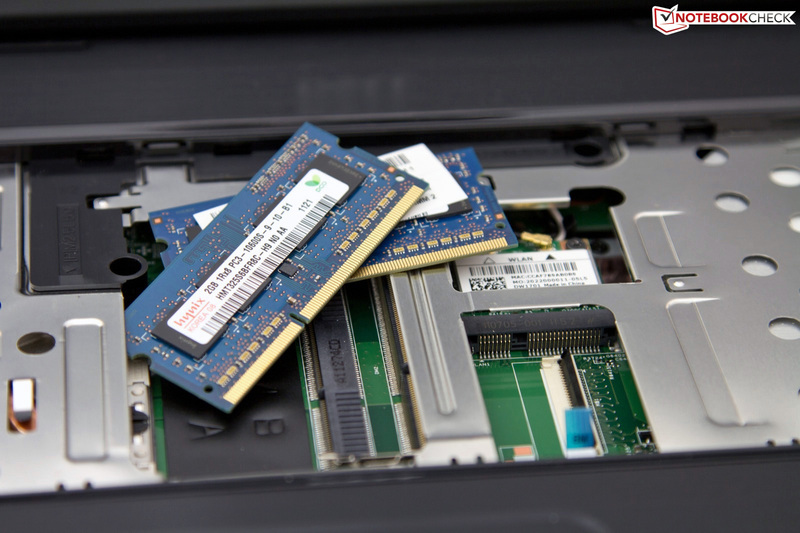 The bottom doesn't have a maintenance cover because the RAM banks and the WLAN module are found directly underneath the keyboard. 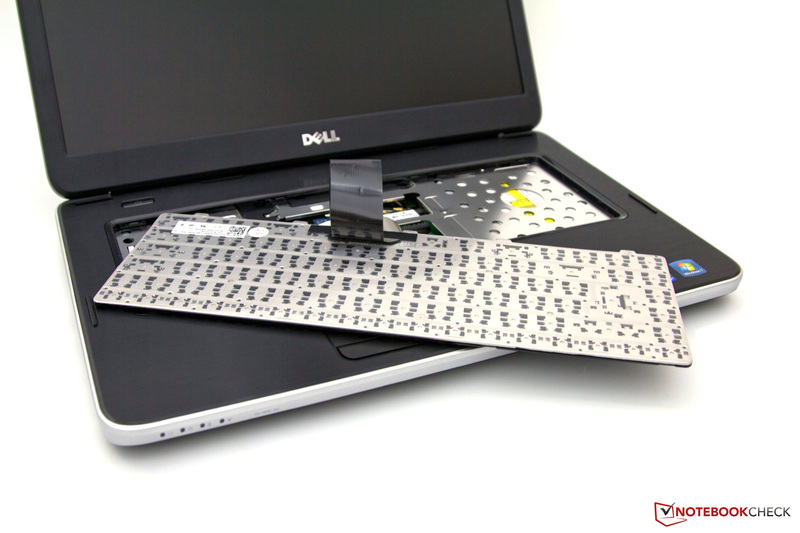 The hard disk and other components are only accessible after removing a few screws on the bottom and disassembling the wrist rest. Basically, this step is also simple and done within a few minutes. The case's sides accommodate a basic interface standard. In addition to three USB 2.0 ports, a HDMI and VGA out and a card reader, there aren't any surprises. 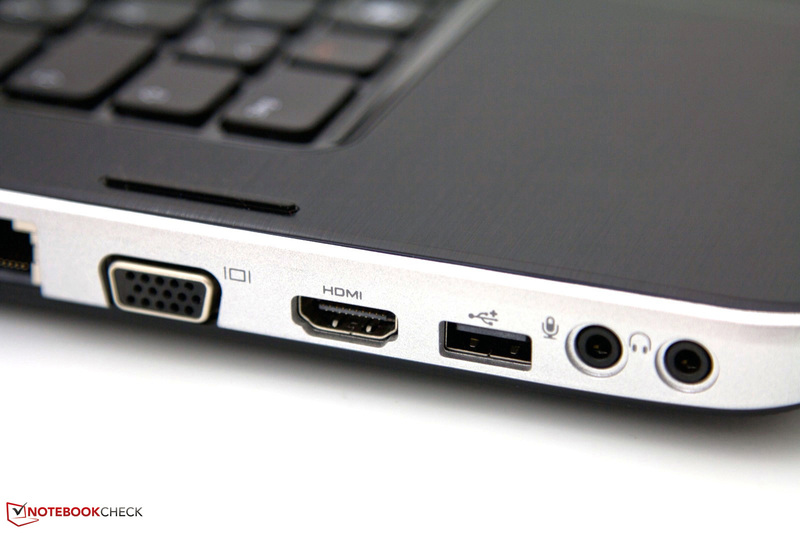 Cutting edge ports, such as USB 3.0 and eSATA, aren't installed. In the somewhat more expensive Vostro 3550 you'll not only get faster hardware, but also more interfaces. However, both devices don't have a docking port. The interface positioning is front-heavy and thus suboptimal. On the right, you'll find two of the three USB ports that interfere with the ergonomics when an external mouse is used. Strangely, a picture with a different interface positioning on the device's right is found on the notebook's German product website, which we like better. 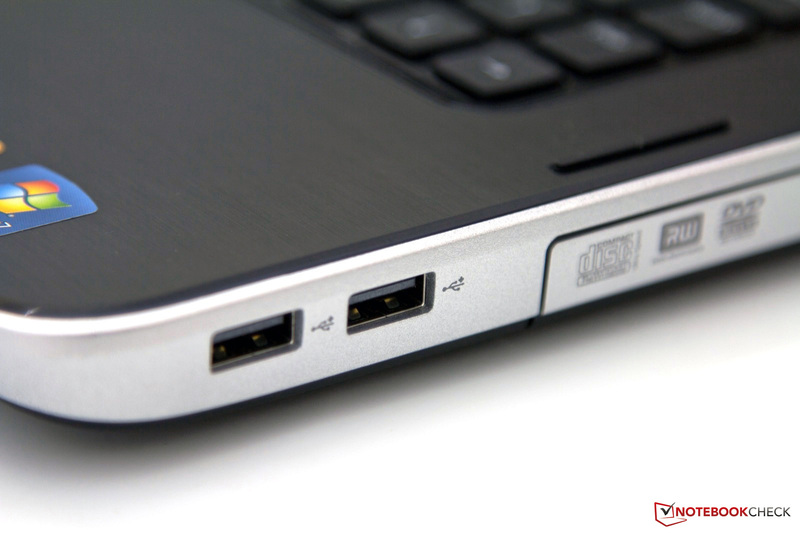 Generally, the distribution of the single ports isn't anything unusual and there won't be any problems with room. Communication isn't a problem with the Vostro 1540. It supports Bluetooth 3.0 +HS in addition to Gigabit Ethernet and WLAN standard 802.11 b/g/n. Except for an integrated 3G UMTS module, which would go beyond the price range, everything that complies with state-of-the-art is installed. 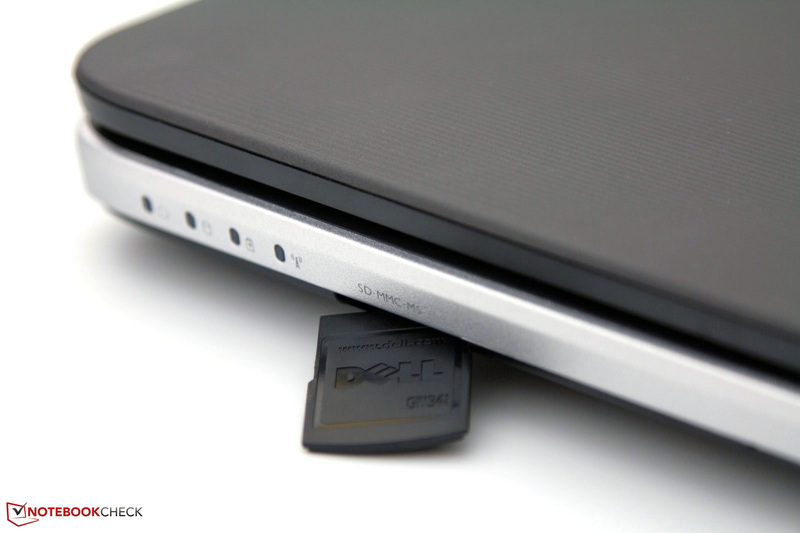 A UMTS dongle with a prepaid SIM card would be a low-priced alternative to a built-in module. The scope of delivery isn't very extensive ex-factory. 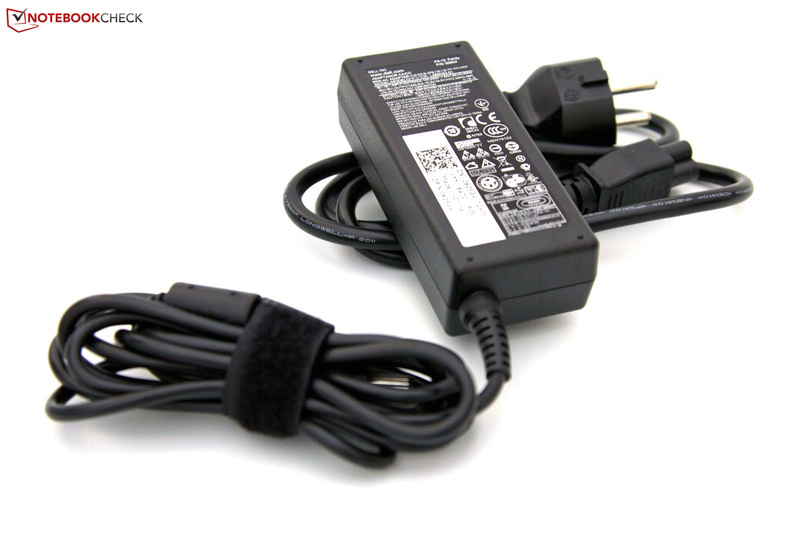 Apart from the laptop, there is a 65 watt power adapter (cord length: 175 + 80 cm / 68.9" + 31.5"), the 6 cell battery, a bit of documentation and a recovery as well as two software DVDs. Thus, there aren't any extras included and they would have to be bought additionally. In comparison to a genuine B2C device (end customer), this step is logical for a corporate device. In return, the preinstalled software bundle is a lot bulkier, but the motto "quality and not quantity" should be focused on here. Besides Office 2010 Starter and Adobe Reader X, the usual trial versions as well as an anti-virus program trial version is installed. A clean Windows installation would likely not only have pleased us. The warranty period also varies according to the retailer for this business device. 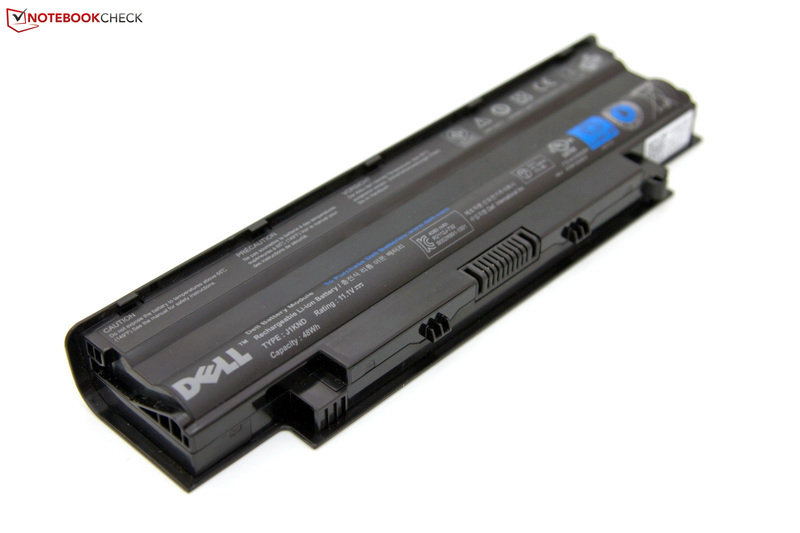 A 12 month warranty with service for the next business day is offered directly by Dell ex-factory. An extension of up to 36 months is available, but it is important to note that the right of return for this B2B offer is not applicable. Other online stores sell the notebook with the standard 24 month warranty including return policy. The input devices haven't been altered. 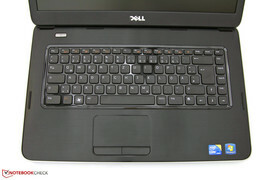 Dell uses the familiar chiclet style keyboard and the corresponding, but somewhat narrower touchpad with multi-touch support in the Vostro 1540. 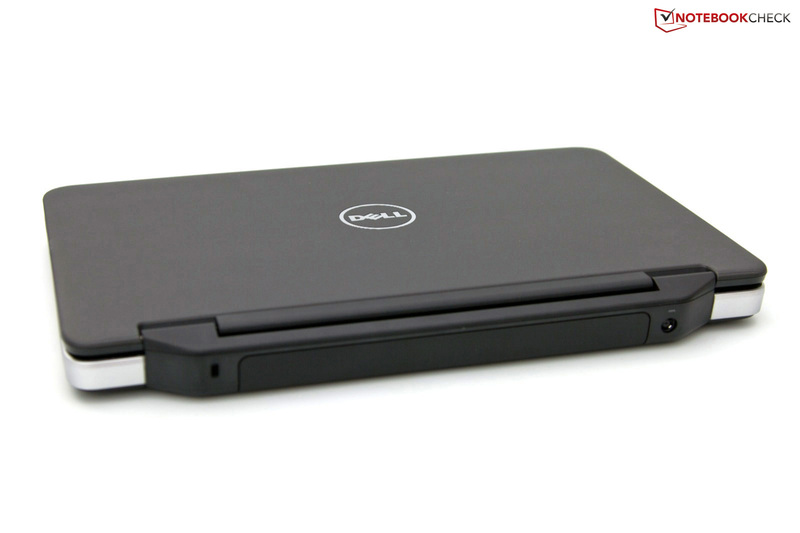 Here, for example, the equally sized Dell Vostro 3550 serves as its epitome. 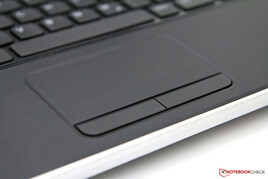 Unlike this device, the backlit keyboard and chrome-colored touchpad bezel is not found in the Vostro 1540, though. The keyboard field's loose fit and the pliable surface are points of criticism in our sample. 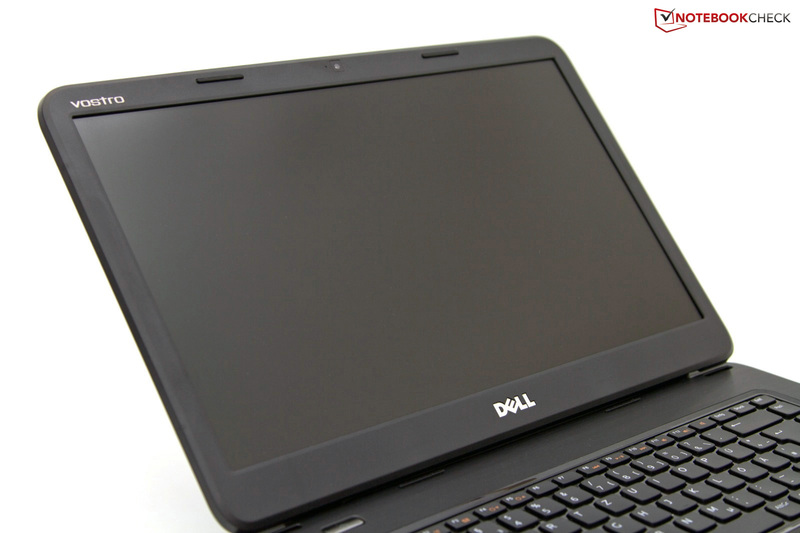 Dell bids a basic standard in terms of display. The 15.6 inch screen shows up with a business-typical matt surface. The LG screen (model: LGD02E3), with a resolution of 1366x768 pixels in a 16:9 format, won't surprise any user nowadays. There is no higher quality hardware option intended for this entry level device. Thanks to the HDMI and VGA out, external monitors can be used without problems. A functional test with 1920x1080 pixels (Full HD, 1080p) confirms this. As usual, we begin the measurements with the screen's brightness. We measure this with Gossen Mavo Monitor. The screen is in the current midfield with a maximum rate of 225 cd/m2 and an average of over 200 cd/m2. The illumination of the entire surface can be described as "good" with 84%. The brightness decrease toward the right won't be noticed in daily routine use. The focus is satisfying, but the colors look rather pallid and weak on this laptop. The other measured rates confirm the screen's previous mediocre presentation. The black value is definitely too high and makes black look rather gray and lets the contrast of 134:1 plummet in the end. Playing movies or looking at pictures from your last holiday isn't any fun on this screen. Naturally, the question about the reproducible color space of a business laptop will turn up. The frequently used sRGB profile is only covered to a part by our sample. Thus, professional use won't be possible with it. Hobby photographers and home users can ignore this shortcoming. The Vostro 1540 has good prerequisites for outdoor use due to an acceptable screen brightness and matt surface. However, the weak contrast ratio proves to be a stumbling block in the practical test. Working is still easily possible indoors or in a shady place. On the other hand, the image fades in direct sunlight or light incidence and you'll have to look for another position. Overall, the screen scores considerably better than most glare-type screens found in this price range, though. The viewing angle stability is on the standard of a low-cost TN screen. Horizontal viewing remains stable up into narrow angles of around 150 degrees. But only a slight vertical deviation of about 10 degrees is enough to cause the reference picture to invert or over-illuminate. In addition, we noticed a fairly quick brightness decrease in both directions of motion negatively. 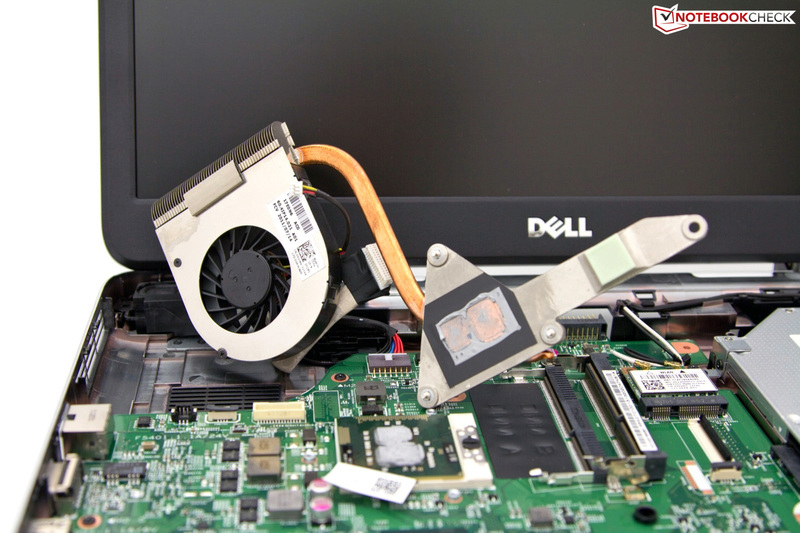 Dell currently offers two different processors for the Dell Vostro 1540. 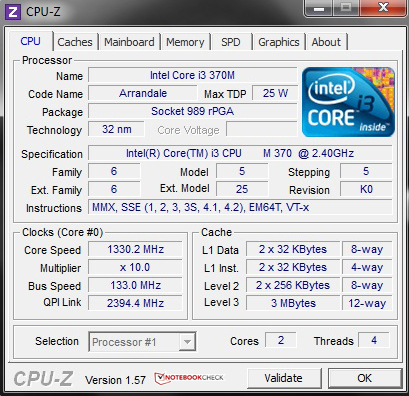 In addition to an Intel Celeron P4600, you can choose the Intel Core i3-370M dual core CPU from last year's Arrandale family. This CPU is an entry level solution that contains Intel's HM57 chipset with a clock rate of 2x 2.4 GHz, a 3MB L3 cache and Hyper Threading support. Today, it is replaced by the more modern Core i3-2310M Sandy Bridge processor that includes the HM65 chip. 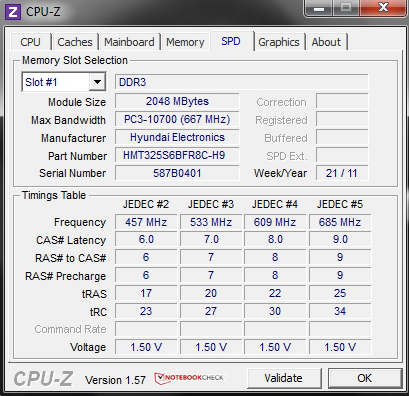 The 1540 uses the Intel GMA HD embedded in the processor as the graphics unit. It is specially designed for office applications. The new processor's graphics makes a stronger impression and it also feels comfortable in the world of multimedia, including 1080p rendering. The Intel Core i3-370M achieves 7536 points in Cinebench R10's (64 bit) multi-thread processing and is on a par with the newer Intel Core i3-2310M. 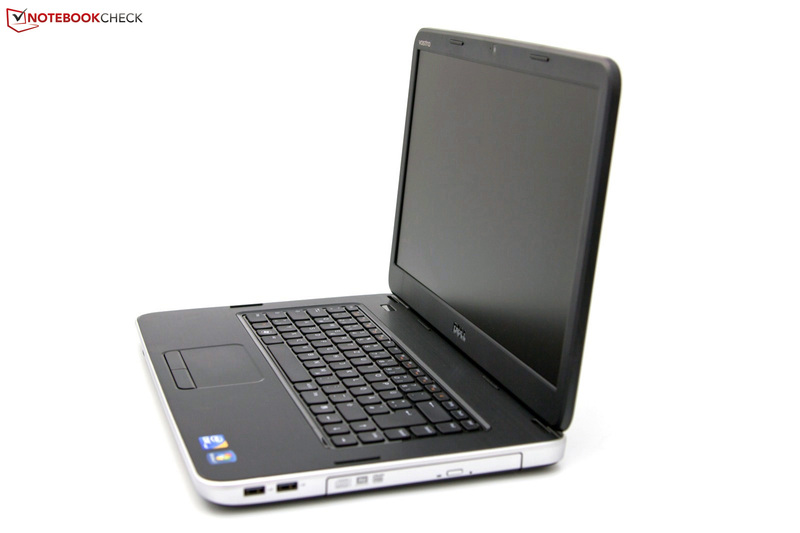 The Acer Aspire 3750 or the Sony Vaio VPC-EH1M1E/W is for example in its immediate vicinity. 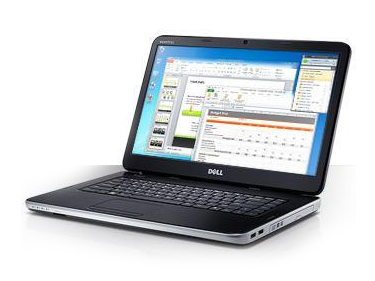 Overall, it shows a good computing performance, whereby efficiency also plays a role. But more about that in the course of this review. 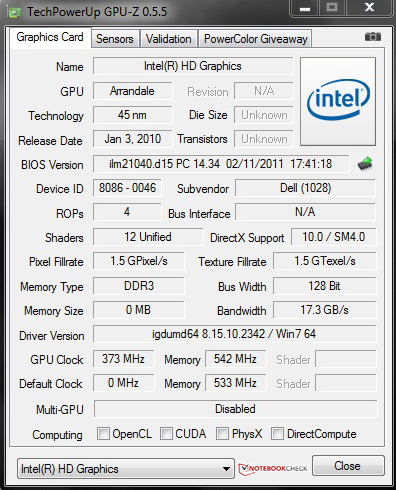 The processor-incorporated Intel GMA HD Graphics finds its limits in the synthetic gaming benchmarks. The notebook moves in the lower third of our database with a result of 1559 points in 3DMark 06. 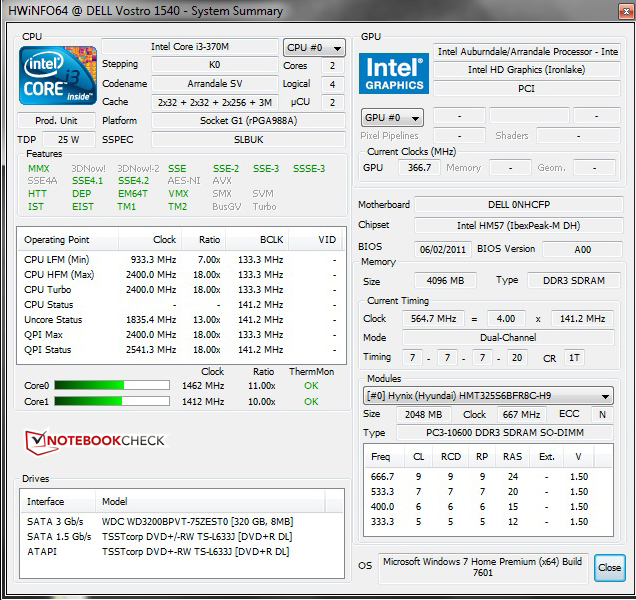 Current Sandy Bridge notebooks with the advanced Intel GMA HD 3000 Graphics score twice as well on average. Lenovo's ThinkPad Edge E320 manages 3098 points and therefore bids a performance advantage of 199%. Both solutions aren't suitable for gamers. 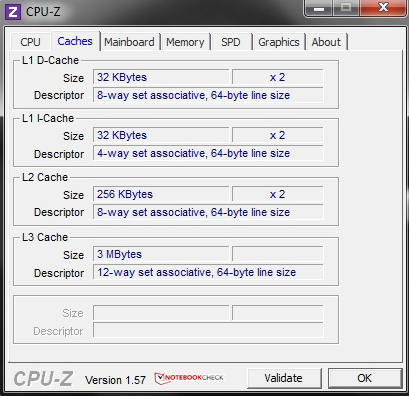 However, in particular multimedia applications are possible with the faster GPU. The cross-component system benchmarks, PCMark Vantage and PCMark 7, confirm the lower midfield performance image that lacks performance reserves. Nevertheless, the given performance is more than sufficient for simple office applications. Dell has three different memory medium alternatives available for this range. 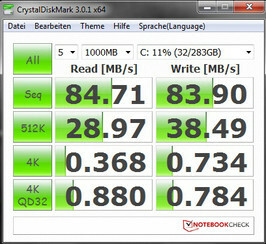 In addition to a hard disk with 250 and 500 GBs, there is also the midway with 320 GB that we tested. 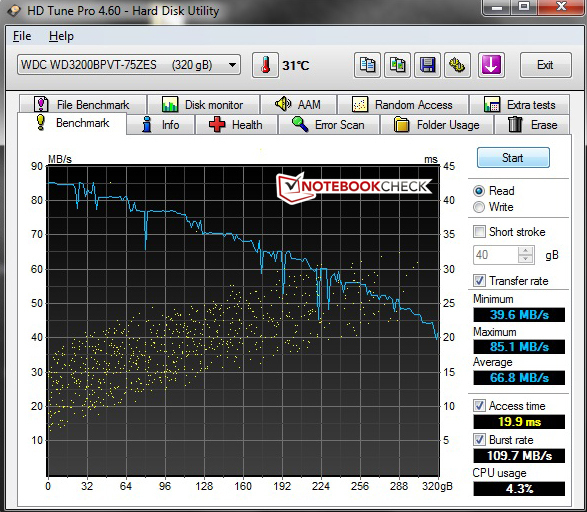 The installed Western Digital Scorpio Blue, model WD3200BPVT-75ZEST0, works with 5400 rpm and is connected via a SATA II connector. The performance isn't anything special with average access rates and a maximum transfer speed of 83.9 MB/s (CrystalDiskMark). However, the price-performance ratio is all right in this series. Exchanging the hard disk is quickly accomplished - but removing the wrist rest isn't as convenient as an own maintenance cover on the case's bottom would be. 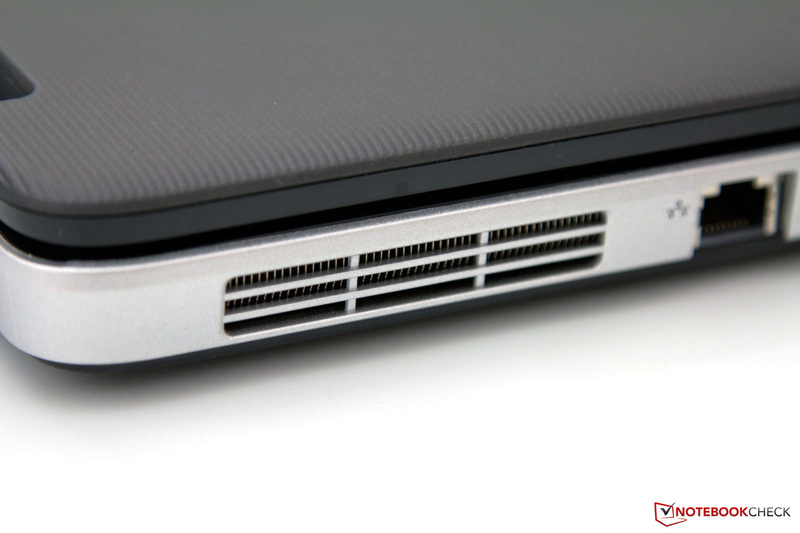 The built-in case fan, the memory medium and the DVD drive are potential noise makers in the Vostro 1540. 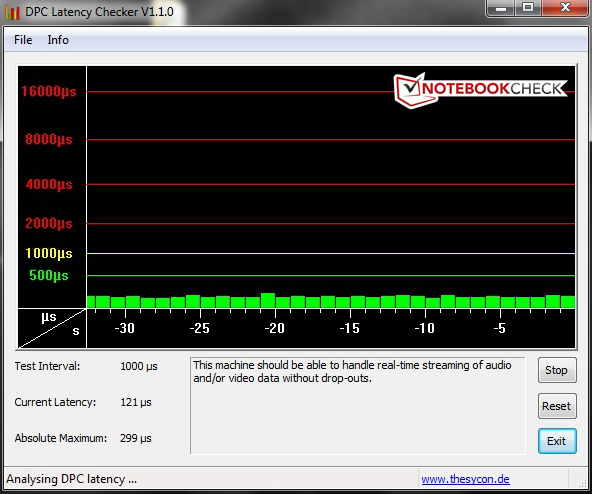 The noise level is consistent with 30.5 dB (A) in idle mode, whereby the fan is inactive. Merely the hard disk is noticed in this scenario with 31.2 dB (A). Basically, a satisfying result as you would expect in an office notebook. 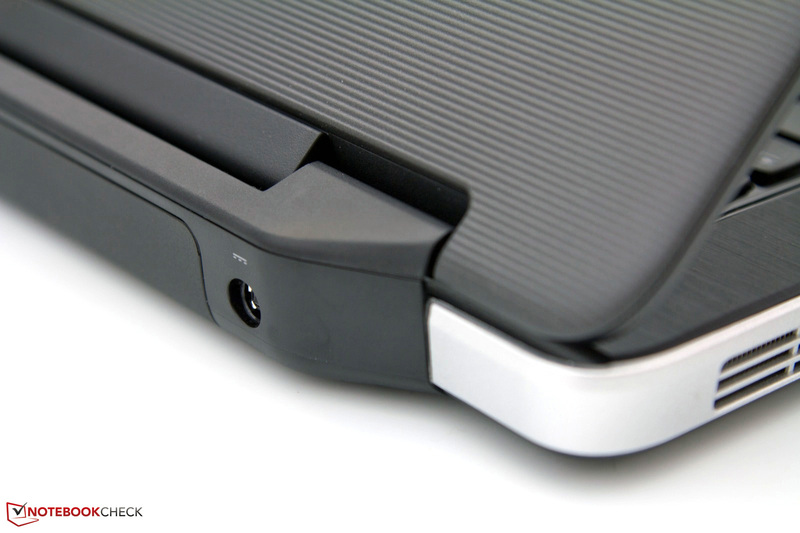 The device attracts attention during load and when the DVD drive is used. It is very audible with a maximum of 39.1 dB (A). The fan's fairly rapid decrease in speed after finished work is positive. The temperature development on the case's outsides is acceptable for this configuration. The case remains within a pleasant range with a maximum of 30.7°C in office mode. Subjectively, these rates are perceived as lukewarm. Of course, the components' temperatures increase during load. We measured the peak rate of 38.5°C on the bottom, in the fan's area. This fact could get unpleasant during longer use on the lap. The inside, around the keyboard, only heats up marginally compared to idle mode. Criticism would be inappropriate here. 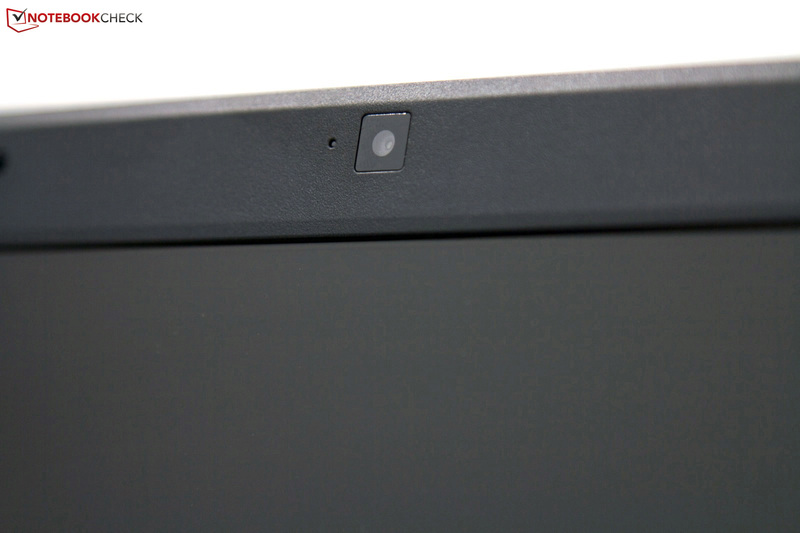 Two stereo speakers for audio playback are located beside the display hinges. They supply a weak and unilateral sound. The trebles are reproduced well and the maximum volume is sufficient. There are no low pitches and basses, though. But this is basically not a drawback for an office laptop because external solutions can be used via the HDMI out or the 3.5mm stereo jack. The older hardware isn't only noticed in performance, because the efficiency of the components has improved significantly with the launch of Intel's Sandy Bridge CPUs. We draw a comparison with the HP ProBook 4530s with an Intel Core i3-2310M including embedded graphics. 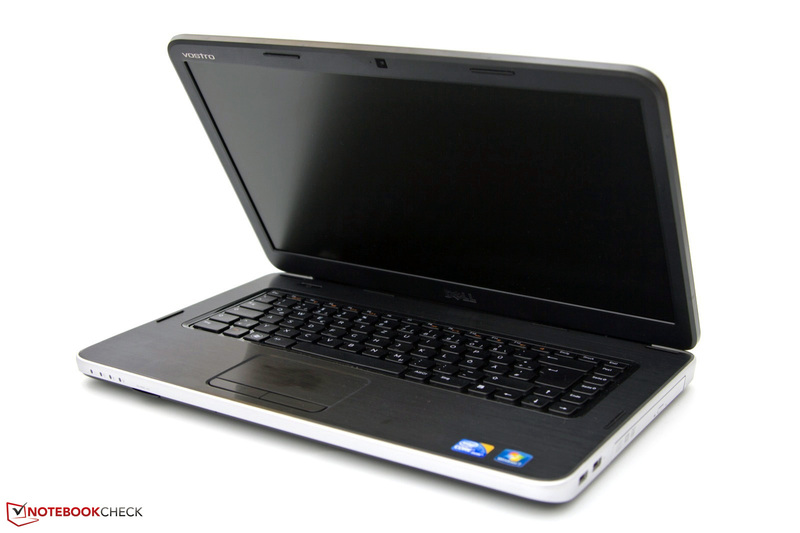 The Dell Vostro 1540 with an Intel Core i3-370M consumes between 9 and 17.2 watts in idle mode. 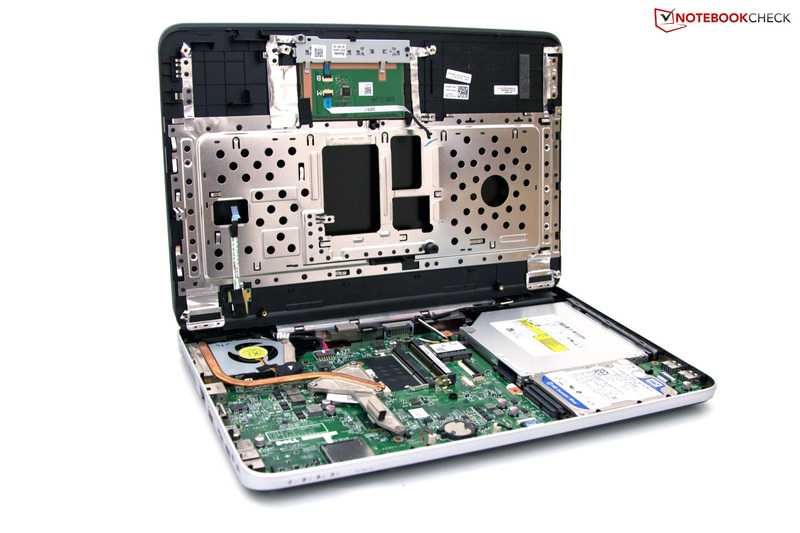 Thus, the laptop is on about the same level as current multimedia laptops with a significant performance plus. 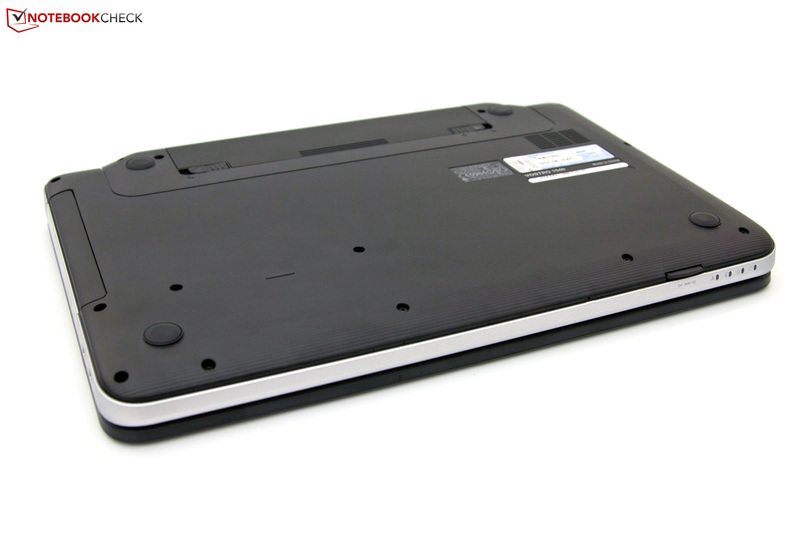 An example from this division would be the Medion Akoya P6631 notebook. The above mentioned comparison configuration consumes a maximum of 12.6 watts in office use, which results in a difference of 26.7 %. The rates of our test device and the HP notebook are equal during load (51.6 to 51.2 watts). However, we must point out the average is a lot lower in the newer ProBook and that it nevertheless bids a plus of performance. Although the Vostro 1540's hardware was state-of-the-art about a year ago, this power consumption is no longer acceptable and the majority of potential buyers will likely opt for the latest and not inevitably more expensive hardware. The battery life, in combination with the included 6 cell battery, suffers under the consumption rates. Overall, it results in a weak range between 4 hours and 40 minutes in idle mode (BatteryEater's Reader's test) and 82 minutes during load and maximum screen brightness (Classic test). The assessment "Surfing via WLAN" represents a realistic average. But the resulting battery life of 3 hours and 27 minutes isn't really satisfying, either. The HP ProBook 4530s, with newer Intel hardware, reaches a battery life of about 8 hours, whereas there are configurations that manage up to 10 hours. 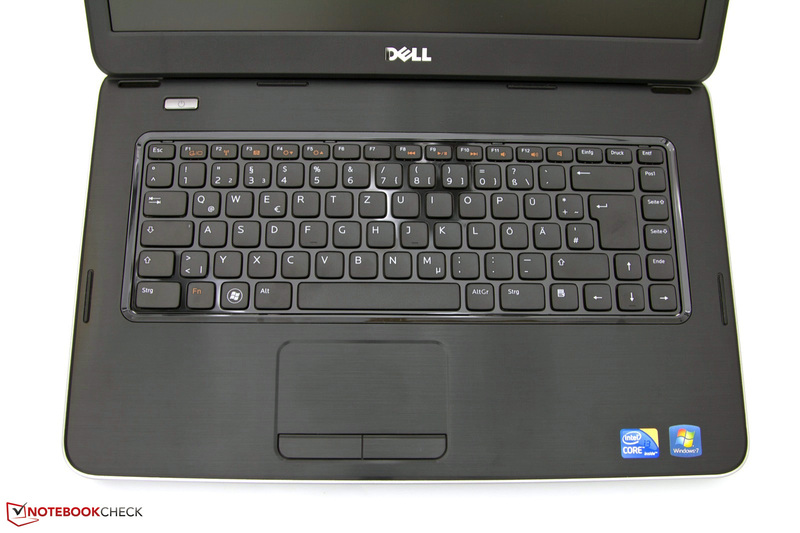 The Dell Vostro 1540 is an average office laptop for users without big demands. The case's design is unexciting and the feel isn't high-end. The scope of interfaces, the communication options and the matt 15.6 inch screen are acceptable, but nothing special. The hardware configuration isn't cutting edge with an Intel Core i3-370M, but the processor's performance can keep up with the Intel Core i3-2310M. However, the graphics and multimedia performance comes too short. 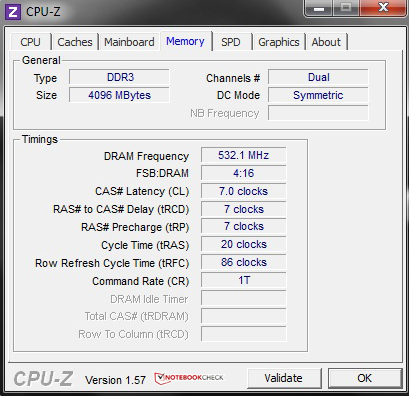 The biggest drawback is likely the CPU's comparatively poor performance and the short battery life. In view of this, the usual short warranty period of only 12 months (B2B) and the not directly accessible hard disk are only minor minus points. 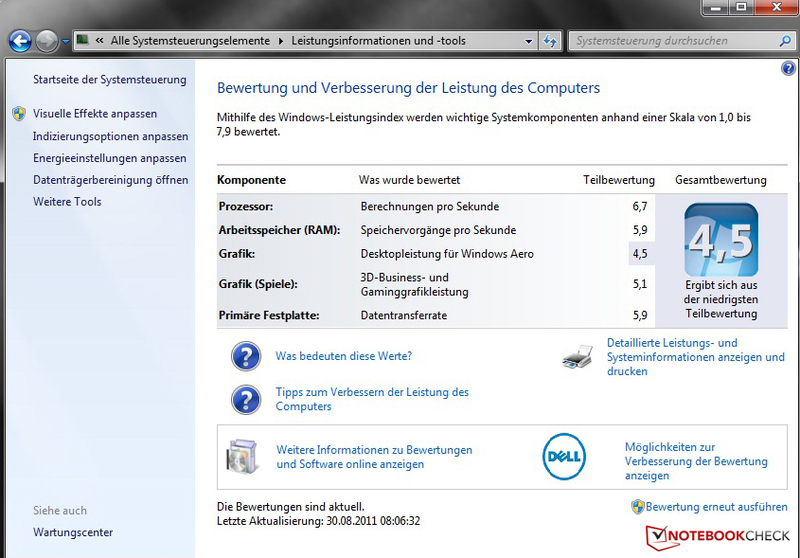 Overall, it's not a special laptop that is available for starting at 369 euros plus VAT. And this takes us to the next major drawback: The Dell Vostro 3550 with Intel Sandy Bridge CPUs and a more attractive design only costs 20 euros more. The new Vostro 3555 with AMD's Llano APUs even cost 40 euros less with a price starting at 329 euros. In view of this fact, we find the Vostro 1540 too expensive. 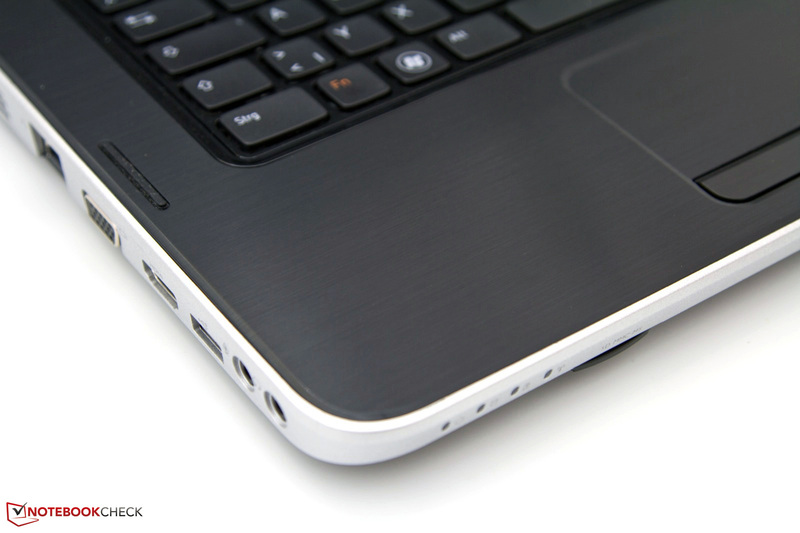 In our opinion, it should sooner be on the price level of HP's 635 for around 299 euros including VAT. The idea behind the Vostro 1540: an inexpensive notebook as a typewriter replacement. The price should however be lower by 50 to 100 euros. A more solid, more stable and haptically more pleasant case and a better 15.6 inch screen. The fact that Dell wants to offer a new, affordable office notebook with only a 20 euro difference in its entry price to the newer Dell Vostro 3550 - despite older hardware. 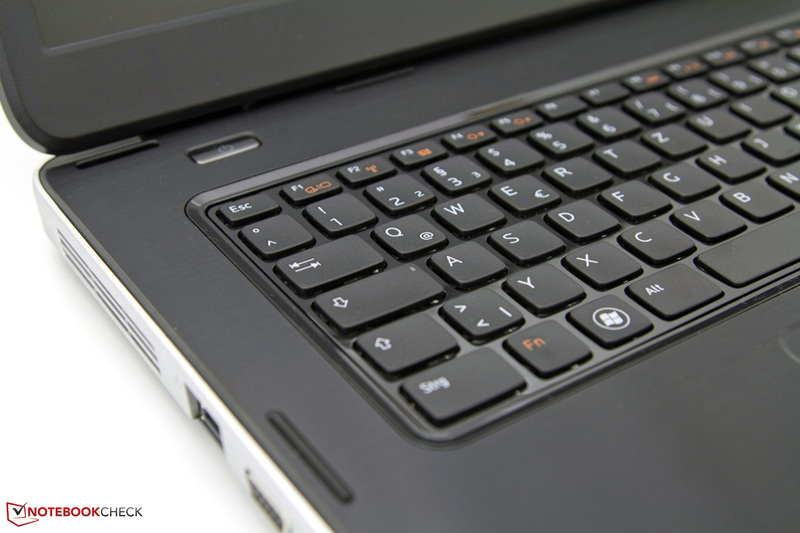 Inexpensive office laptops from the entry level sector, for example the HP 635 for only 299 euros, the Lenovo ThinkPad Edge E520 with the latest hardware, the MSI A6400 or the Sony Vaio VPC-EH1M1E/W. 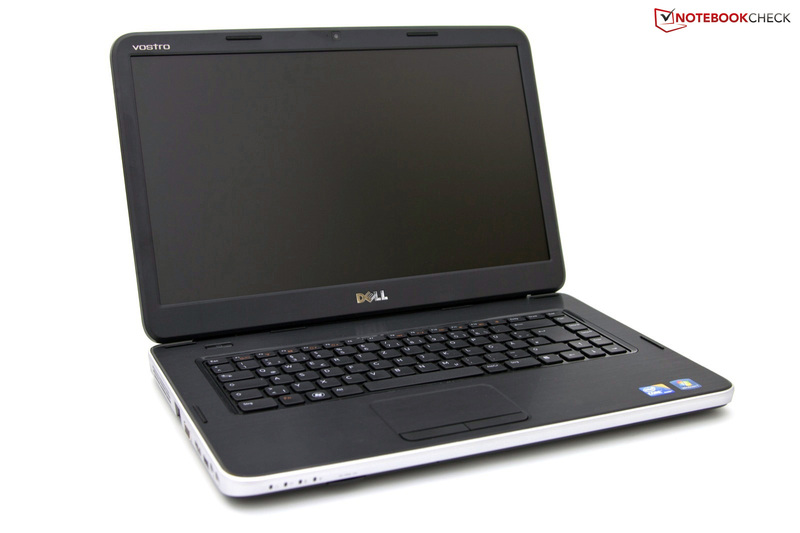 The Dell Vostro 3550 as the newer, but almost equal in price alternative, or the Latitude E5520 is available from the own range. The Vostro 3555 with AMD hardware is also new in the range and even less expensive in its entry price.